• it can support and promote the ethos of the school. • it looks smart We have a school uniform which, though not compulsory, is encouraged. 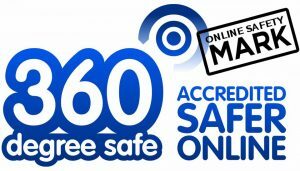 Please follow the link www.schooltrends.co.uk, or click the picture below. 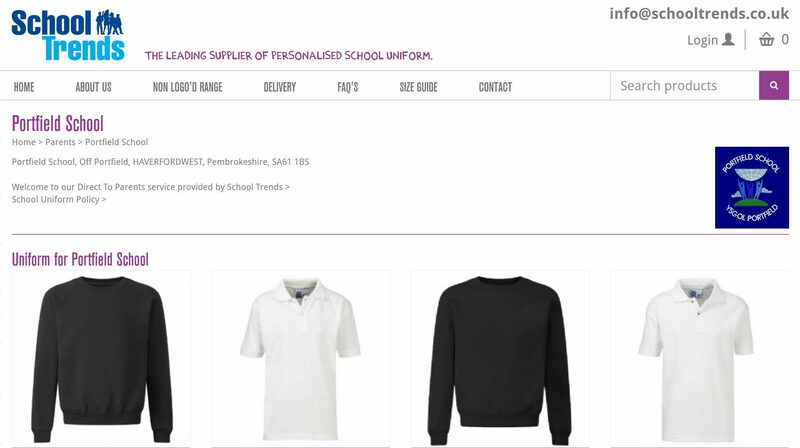 This will take you directly to the Portfield School uniform ordering page. Alternatively, you can collect an order form from school (or by clicking here) and order by post. We encourage all pupils in the Primary and Secondary sector to wear school uniform. Portfield School Council consulted pupils with respect to Sixth Mission Statement 4 Form uniform and has introduced black sweatshirts and white polo shirt with Portfield School logo for pupils aged 16-19. We would like children to wear suitable low heeled shoes to school. School uniform grants may be available from Pembrokeshire County Council for those children in Yr 7 and above. Other items of clothing we encourage are black/navy trousers/skirts. PE kit is also required and includes blue logo t-shirt and navy/black shorts. Occasionally children lose or misplace articles of clothing so please help us to find them by marking all garments with your child’s name. We ask that all children wear the uniform and we encourage them to maintain a good standard of clean and tidy dress in school. However school uniform is not compulsory. For images of school uniforms click here. Pupils accessing Haverfordwest High Comprehensive school for inclusion lessons are required to wear designated sweatshirt and if taking part in PE, the required PE kit. Pupils can wear either HWH or Portfield uniform to Portfield School. For information regarding Uniform please click here to take you directly to the relevant area of their website. All children will need a P.E. bag containing shorts, T- shirt and trainers, and for swimming a bathing costume, swimming hat and towel. The swimming hat helps to keep long hair drier and avoids hair affecting the balance of the learner swimmer in the water. Children will not be allowed to participate unless properly dressed. Where pupils participate in football additional kit requirements for lessons will be given to pupils such as football boots, shin pads and long socks. The school keeps a stock of Portfield football kit for competition use. The school has a second hand uniform scheme which sells sweatshirts, polo shirts, fleeces as well PE kit. The school considers the cost implication of uniform and hence maintains a regular review of its provider and only stipulates basic items Information is provided to parents on the Local authority uniform grant assistance scheme for low income families. The Governors and Staff hope that parents will support the ‘ethos’ of the school by sending their children in agreed school dress. *Footwear should be low heeled for girls and of suitable material for the weather conditions. Flip flops are not appropriate for school wear.